A festive bird to add to your decor. Gather your material. 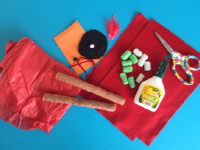 You will need scraps of red tissue paper, red felt, a brown Magic Nuudles Stixx, a red feather, a few green and white Magic Nuudles, white glue and/or hot glue, scissors, a scrap of orange Fun Foam, red yarn, a small white pompom, and a button. Note: I did not use the scrap of black felt shown in the picture. Instead, I simply used a black marker. 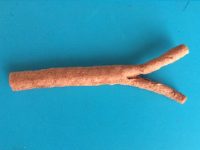 Cut one end of a brown Magic Nuddles Stixx to make it look like a tree branch. Glue two series of three green Magic Nuudles together, squishing them somewhat to represent holly leaves. 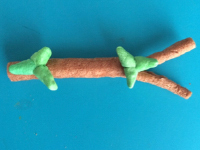 Glue them on your branch. Cut tiny circles out of the red felt and glue them on the leaves (green Magic Nuudles) to represent berries. 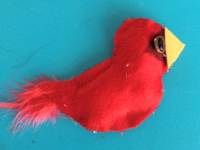 Fold a piece of red felt in half and cut a bird outline out of both layers. Glue the red feather near the bird’s tail. 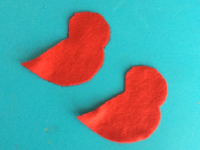 Crumple pieces of red tissue paper and glue them on the bird shapes. 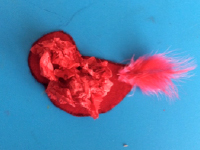 Glue both bird outlines one on top of the other, trapping the tissue paper inside your cardinal. Use a black marker to color a triangle on your cardinal’s face. Glue the button inside the triangle. Cut a triangle out of the orange Fun Foam and glue it on the tip of the bird’s face to represent its beak. 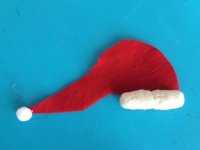 Cut a small Christmas hat out of the scraps of red felt. Glue the white pompom on the tip of the hat as shown. Add two or three white Magic Nuudles along the edge of the hat to represent fur. 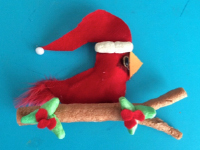 Glue the hat on your cardinal before gluing the bird on the branch. 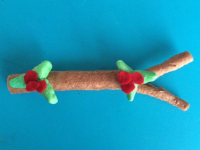 Glue both ends of a piece of red yarn to either side of the branch. 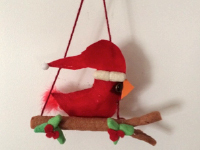 You may have to glue the yarn behind the hat and bird also to prevent your cardinal from leaning forward. 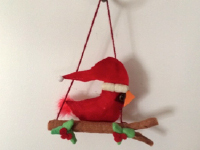 Hang your Christmas cardinal within your daycare or in your Christmas tree.